T: I was not apart of the ring buying experience. Kent was all over it and did it himself. K: My experience with Honey Designs was very pleasant, I was referred by a coworker when I discussed not being able to find the right ring for my girlfriend. We had talked about roughly what she liked in a ring and Chelsea was able to help me create the perfect fit. The experience was really accommodating and she walked me through ever step, making the process fairly quick and easy. T: Kent found Honey Designs and worked with Chelsea to create the best ring for me! K: I was unable to find the style of ring that really fit my girlfriends personality. I feel this is a huge occasion and I wanted it to be the perfect ring. I had been referred and honey design sounded like it would help me with my planning. T: The whole engagement was a surprise! I had not a clue it was coming and was totally shocked. We had discussed marriage and things we both liked in a ring and Kent took it from there. He did a wonderful job completely surprising me! 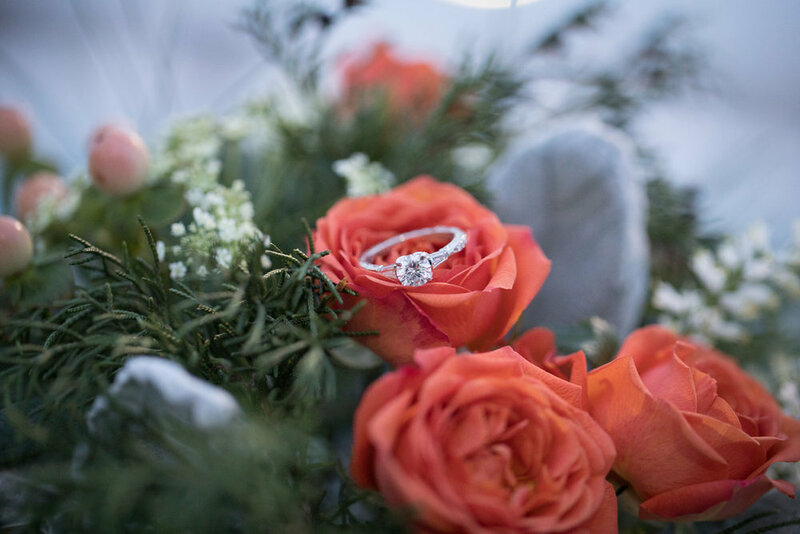 I love how he and Chelsea worked together to create the best day ever from the ring, the cute ring ornament, the awesome concrete ring box, brunch, flowers, and even photos. K: I was surprised at the availability and responsiveness of chelsea. She always responded quickly and was able to help me with some of the hard decisions with the process. She even drove to another city to deliver and help setup the proposal. The amount included with the experience is amazing and helps to make the occasion unforgettable. T: I love it all and that I'm the only one to have this specially made ring. Kent and Chelsea created my dream ring. I love the way it sparkles and I always find myself looking down at it. There are so many things I love about it but I love that Kent and Chelsea talked about things I like and put that into my ring. I love tulips and they created my setting to look like tulip leaves holding the diamond. K: I love that the ring is unique and still looks elegant. I wanted to create a sleek ring that still was modern but still had an antique look, as my fiancé loves rustic. K: We met through a mutual friend on st. Patrick's day. T: Kent came and picked me up for our first date and took me glow putt putting, out for dinner, and drinks. K: Our first date was putt putting and getting dinner afterwards in gahanna. Where’s your favorite hidden gem in Columbus? T: I have a few favorite hidden gems in Columbus I really like Red Apron Pizza in downtown Westerville. I also like to find small antique shops, one of my favorites is Westerville Antiques. K: My favorite hidden gem is in Westerville and is called Yabos Tacos, a small fun restaurant with great food and drinks. What other local Columbus businesses do you love? T: There are so many great places in Columbus. I enjoy Forno, Yabo's Tacos, The W Nail bar, and Nada. K: I am a big fan of Cooper's hawk winery (Easton), land grant brewery (Franklinton), and about any new place in the short north. T: I enjoy going out for dinner and drinks with Kent. I also love to spend the day / evening together shopping or hanging out with friends. K: We enjoy grabbing a few drinks and some dinner with friends followed by playing card or board games.